The District Employment and Counseling Centre, LAHDC, Kargil was established during the year 1981.Today it plays a pivotal role in assisting the youths in getting employment not only within the state but across India both in public sector and private sector. It registers unemployed youth and maintains a data base of theirs skills and educational qualifications. The various public and private sector companies seek data of candidates with requisite skills and educational qualification from District Employment and Counseling Centre Kargil.Thus it acts as a facilitator between the employer and the employee in the emerging market economy. Besides this it also assists the DSSRB LAHDC Kargil in filling up the various vacancies referred to it by various government departments. The Deputy Director District Employment Counseling Centre Kargil acts as the ex-officio member secretary of the District Service Selection Recruitment Board Kargil. It also implements various schemes of the government relating to unemployment. 1. Registration of unemployed youth. 2. Implementation of Jammu and Kashmir State Self Employment Scheme. 3. Implementation of Voluntary Service Allowance (VSA) Scheme. 5. Registration of Self Help Group. 6. Collection of Employment Market Information. Registration is a Voluntary process. The unemployed youth should come forward for their registration as it helps. To create and maintain a database of all the unemployed educated youth of the state for policy planning by the Government. To Categorize different unemployed youth according to their qualification and technical qualification. Access to reading rooms / career corners providing essential educational and preparatory materials for various competitive exams / admission to training institutes. Access to the World Wide Web for downloading examination / recruitment forms and other related information. Access to the expert counselling. Eligibility for Voluntary Service Allowance if member of target group. It is essential to be registered with DECC to avail benefits under the various employment generating schemes being implemented by other departments/ institutions VSA etc. Original Copies of all Qualification Certificates. Jammu and Kashmir Self Employment Scheme (JKSES) was launched in 1995 to promote entrepreneurship among the educated unemployed youth aged 18-42 of J&K State. 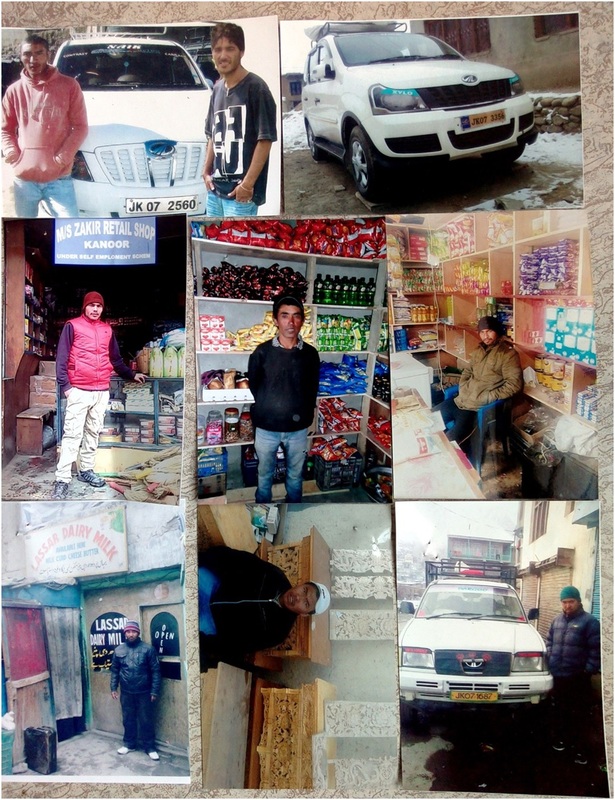 In this regard the scheme has implemented in the District, and provide the funds from the District plan, LAHDC, Kargil on account of Margin Money, Capital Subsidy and Interest Subsidy in favour of the entrepreneur who has established their venture for income generating. Age 18-42 for qualification in the general category and 5 years relaxation for women and persons belonging for SC/ST/Ex-Serviceman / physically handicapped. Holder of at least a middle pass certificate. Candidate should be unemployed and should not have drawn any loan from any bank / financial institutions for setting up of venture of his/her own. The selection of the candidates is done by the District Task Force Committee (DTFC), headed by the concerned District Development Commissioner, after inviting application from all the interested eligible persons and interviewing them to assess the technical feasibility and economic viability of the project, the cases of the selected person are then sponsored to the various banks for sanction of loan on their favour. Once the cases are sanctioned, margin money and subsidy in released by the employment department into their accounts. After the units are established, interest subsidy is released periodically into their loan accounts. The candidates selected by the DTFC, can establish their units with the following upper ceiling of project costs. For Joint Venture (minimum two people) Rs 10.00 lacs. The entrepreneurs who establish their units are entitled to interest subsidy in the following pattern. The Scheme is on hold vide Government order No: ED/Accts/ Bud/ Announcement / 2010-11 Dated: 10.04.2015. The Voluntary Service Allowance Scheme (VSA) has been launched as a part of “Sher-i-Kashmir Employment and Welfare Programme for Youth” The objective of the scheme is to provide financial support to eligible educated unemployed youth aged between 26-37 years. In exchange for VSA, beneficiaries may have to render 12 hours of service per week. VSA Support is given for three years, with the expectation that by the end of this period, the beneficiary will have found a suitable employment. Educational qualification of matriculate and above. Age of 26 years or have not exceeded the age of 37 years on January 1st in the year of application. Compulsory registration with District Employment and Counseling Centre. Annual House hold income does not exceed 1.50 lacs from all sources. Rs 700/- per month for 12th passed and ITI/other equivalent qualification. Rs 850/- per month for 12th passed + professional qualification (3 years from a recognized institution). Rs 1000/- per month for Graduates. Rs 1200/- per month for Post Graduates and Engineering / Medical Graduates and equivalent in the field of computer science, technology and education. (An additional Rs 50/- per month is granted to qualifying women candidates). To educate the unemployed youth about the career opportunities and to build their confidence and understanding of their own intrinsic potential, the Department of Employment provides career counseling and guidance. Experts are invited for providing valuable, personalized advice for developing soft skills. We also conduct training programme for emerging entrepreneurs in many areas, including managerial and accounting skills, quality management, marketing, interaction of new technologies etc. District Employments and Counseling Centre also provides information regarding all Government jobs and advertisement issued by J&K Public Service Commission (PSC) / J&K Services Selection Board (SSB), Zila Sainik Board, etc. The number of members of each Self-Help Group should not be less than 5 and not more than 10. The Self Help Groups should be registered with the Registrar of Firms (Director I&C) as firms. Members should necessarily be Diploma Engineer (3 years) or Degree holders. None of the members or the group leader should be employed elsewhere. The members of the Group should not be listed in more than one Self-Help Group in the same District or some other District. All original documents be verified by Officer in-charge personally. On the fulfillment of these conditions, the group would be registered as Self- Help Group and an Identity Card issued. The Deputy Commissioner / CEO, LAHDC, Kargil functions as Chairman and Deputy Director Employment Kargil as member secretary of the selection committee (DSSRB, LAHDC), Kargil. This office issued the NOCs in favor of the unemployed youths for establishing of various income generating units and to desirous candidates who needs the certificates for various purposes. During the year 2016-17 till date, this office issued NOCs in favour of (389) desirous unemployed youths. The DECC Kargil renders career advice and counseling to the aspirants of competitive exams. Candidates can visit our office for queries related to career any time. Besides this we also organize Career Counseling Programs in different corners of the district for the youths as and when grants are available for the same. A small library with books on competitive exams is maintained by District Employment and Counseling Centre Kargil for the general public.